Arcadia Valley - Is the Top of Missouri Worth Exploring? Home Missouri Arcadia Valley – Is the Top of Missouri Worth Exploring? Arcadia Valley – Is the Top of Missouri Worth Exploring? 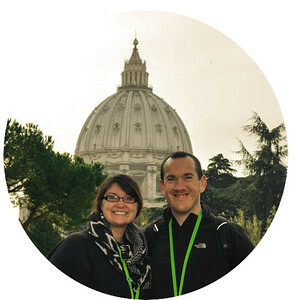 When you think about climbing to the highest point in any location, it’s fair to say that you will be doing this for one of many possible reasons. Are you looking to stay in shape? Do you want to conquer a bucket list of “high” mountains? Or perhaps, if you are like us, you are simply hoping to experience the breathtaking panoramic scenes from the summit that will reward you for the effort to reach the top. 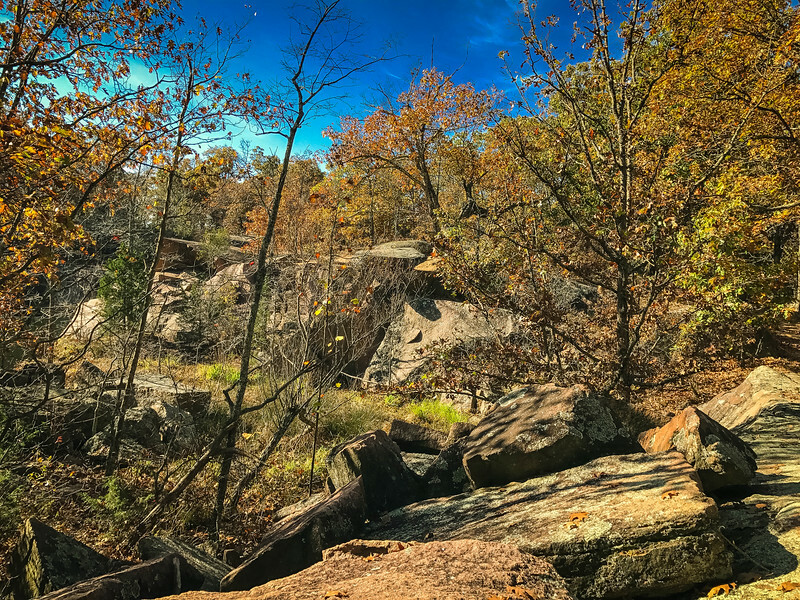 Arcadia Valley in the heart of Missouri may not be the first area you think about venturing to on a hiking excursion but having visited this area a couple of times recently, we want to share a few reasons why this should be on your radar. 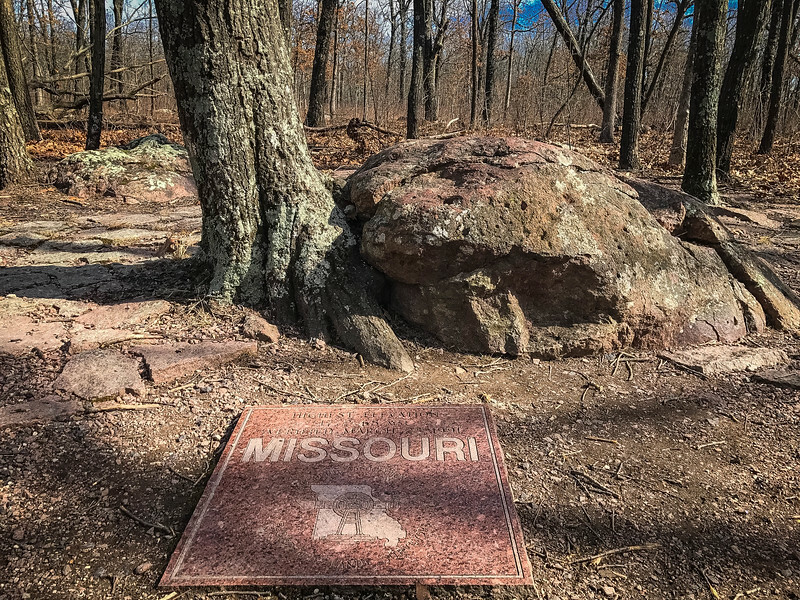 Taum Sauk Mountain is the highest point in Missouri, so during one of our recent trips to St. Louis, we decided to check out this location in hope of finding some spectacular scenery across the Saint Francois Mountains in the Ozarks. Although this is the highest point, there are plenty of other attractions in the Arcadia Valley including the spectacular sight of Johnson’s Shut-Ins State Park and Elephant Rock State Park to name just a couple of attractions we are going to cover. The Ozarks are certainly an attractive region in Missouri and Arkansas but I strongly recommend considering the best time of the year to visit in order to fully appreciate the beauty here. Our visit was in early Spring when there was very little color and I think the Fall would certainly be the perfect time to enjoy the natural beauty here. 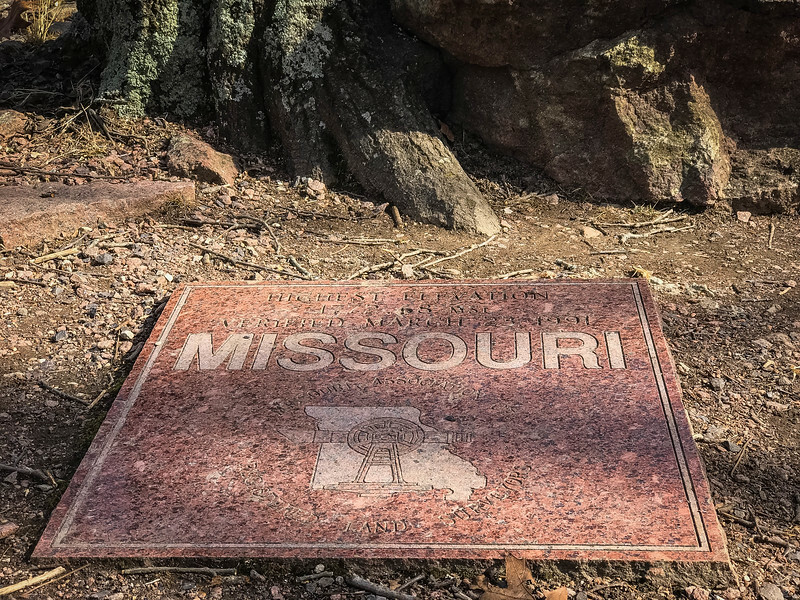 Let’s take a look at our adventure as we embarked on a journey to the top of Missouri! 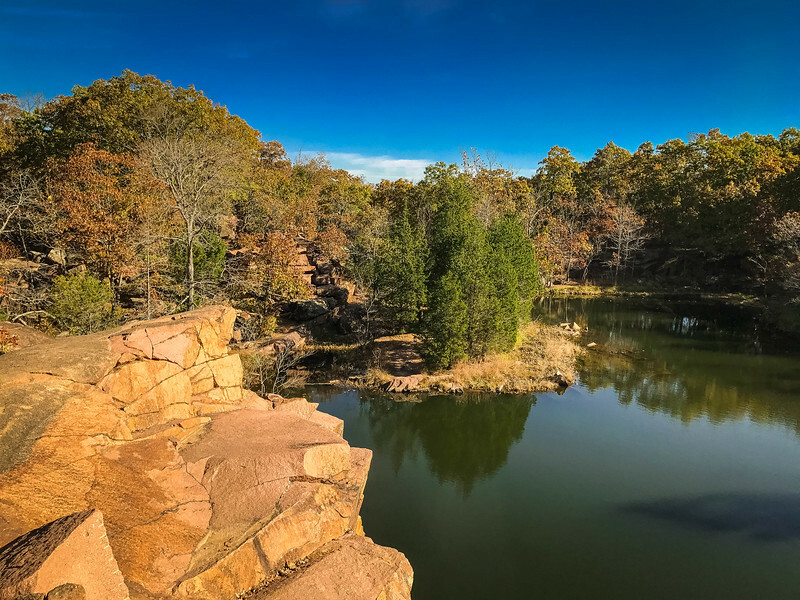 A weekend in St Louis may also lead to spending a couple of days in the Ozarks and this is definitely a great part of Missouri to explore. How to Reach the Arcadia Valley? If you are an avid hiker or love checking off the highest points from your bucket list, you will know that many “high points” can be either inaccessible or very difficult to reach. This is definitely NOT the case with Taum Sauk Mountain in Missouri. In fact, it’s probably one of the easiest across all 50 US states! 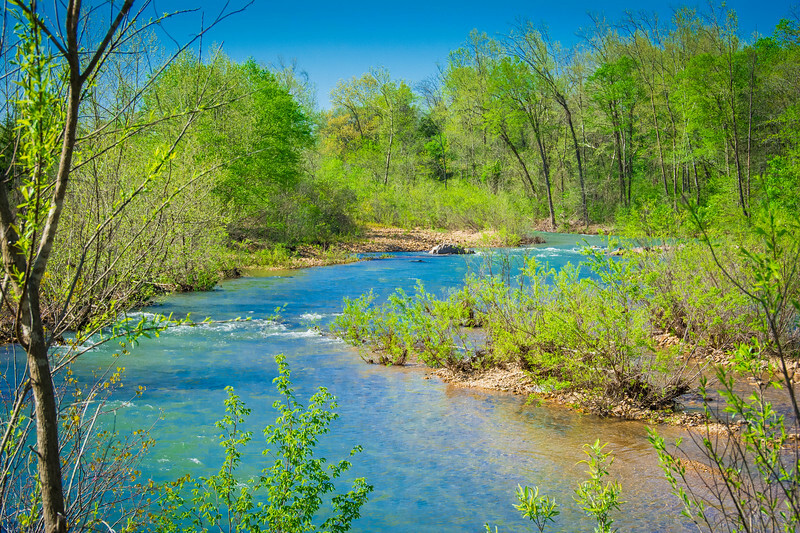 The Arcadia Valley includes the towns of Arcadia, Ironton, and Pilot Knob but it’s the access to the gorgeous Ozark Mountains that makes this such an attractive region in Missouri. 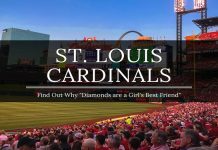 If you are planning on staying close to the Arcadia Valley and prefer not to take the “camping” route, why not consider staying in nearby Farmington, MO. There are a number of hotel options available and from here, you are just a short distance from all the attractions we reference below. For those of you interested specifically in reaching “the top of Missouri”, here are the directions you should follow. 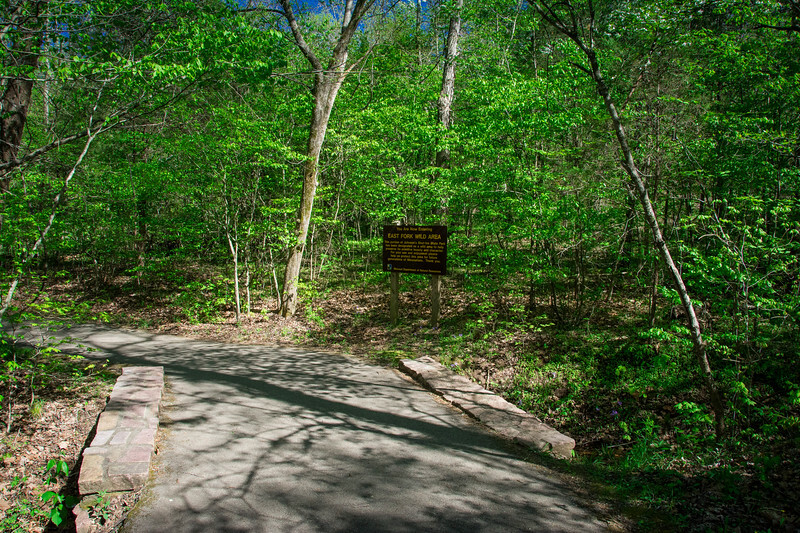 Head along MO Route 21 to Taum Sauk Mountain State Park. It is a well-signposted route and until the final stretch (only a mile or two) it is all tarmac road so you don’t have to worry about “offroading” or dealing with gravel/dirt roads. 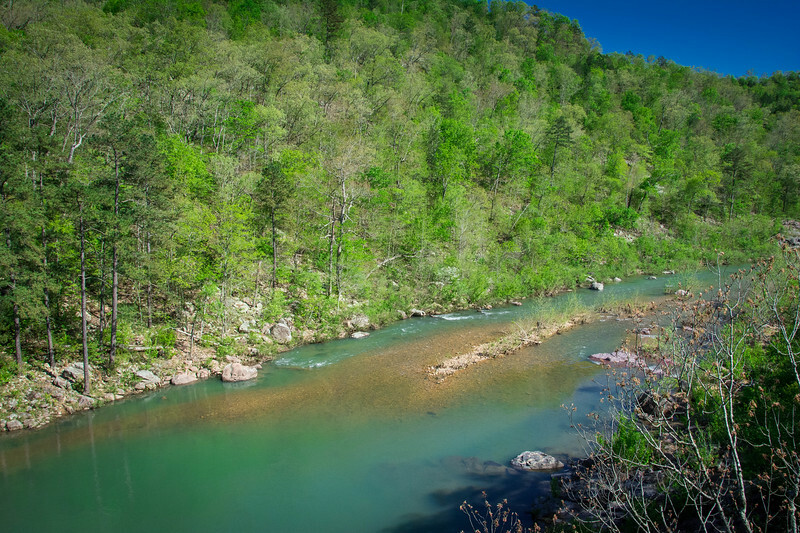 Both Johnson’s Shut-Ins and Elephant Rock State Park are within a short driving distance of Taum Sauk (30-45 minutes). There are numerous overlooks on this route that we strongly recommend experiencing especially when we tell you that the culmination of this route is not necessarily what you might be expecting! The majority of the climb to Taum Sauk Mountain can be accomplished by vehicle and it’s only the final stretch once you reach the State Park that you have to park your car and take a short hike to the summit. 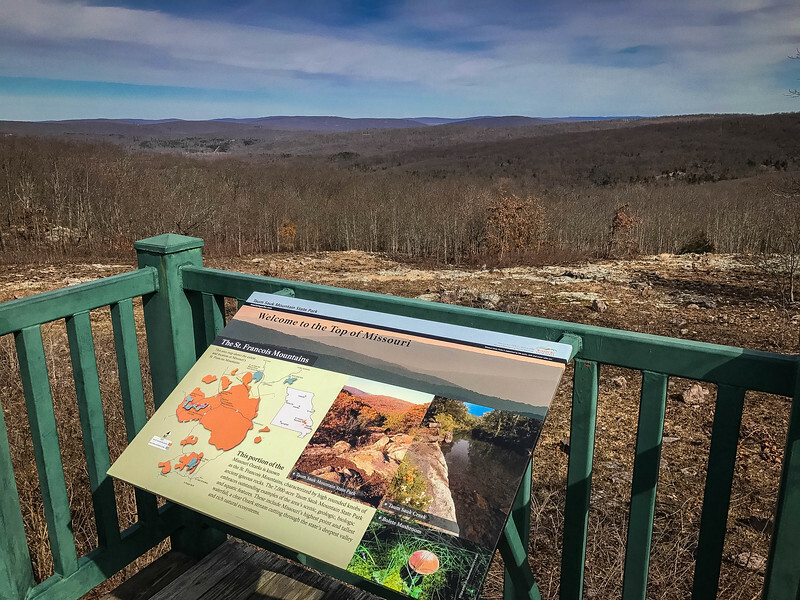 The drive throughout Arcadia Valley and the journey to the summit of Taum Sauk Mountain is potentially more attractive than the actual experience once you arrive at the highest point. There are numerous spots that you will want to pull over on the side of the road and just admire the natural beauty surrounding you. There are also a couple of overlooks once you reach the final part of the drive that actually provides further information on the view and some iconic attractions you can see in the distance. 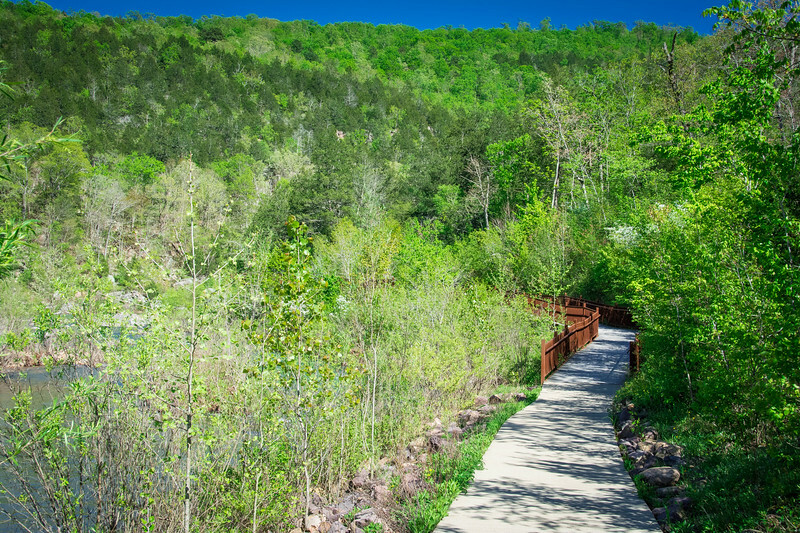 Located in the St. Francois Mountains, the park’s wooded areas and rocky glades provide a beautiful, solitary experience for hikers. For those of you that are not particularly adventurous and simply want to appreciate as much beauty as possible from the confines of your vehicle, Missouri’s highest point is one of the more rewarding experiences if you have limitations restricting you from hiking around. 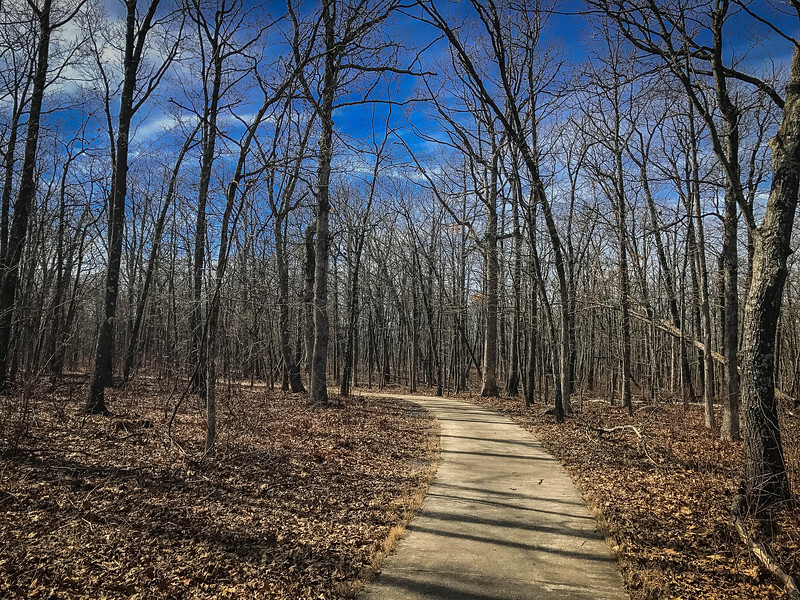 But the real beauty starts when you put on your favorite hiking shoes and head out into the Ozarks to appreciate those “wooded areas and rocky glades” as the Missouri State Parks website refers to them. 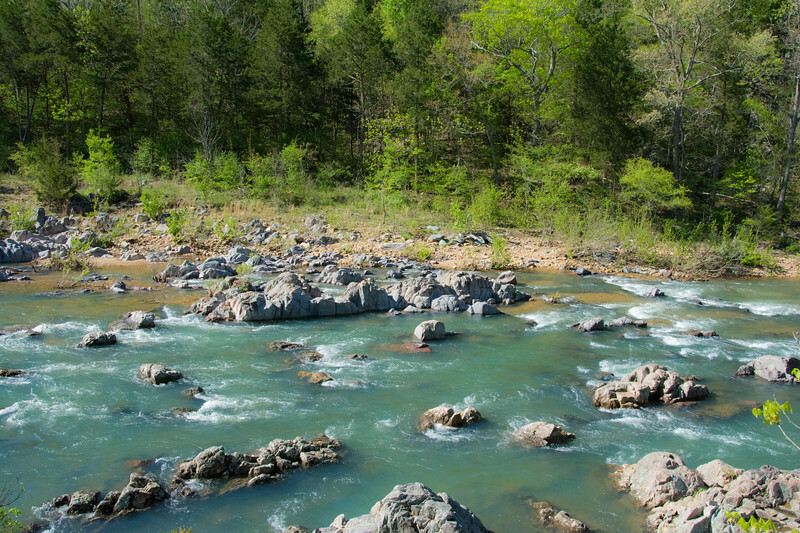 The St. Francois Mountains offer some of the most spectacular scenery throughout the state of Missouri. 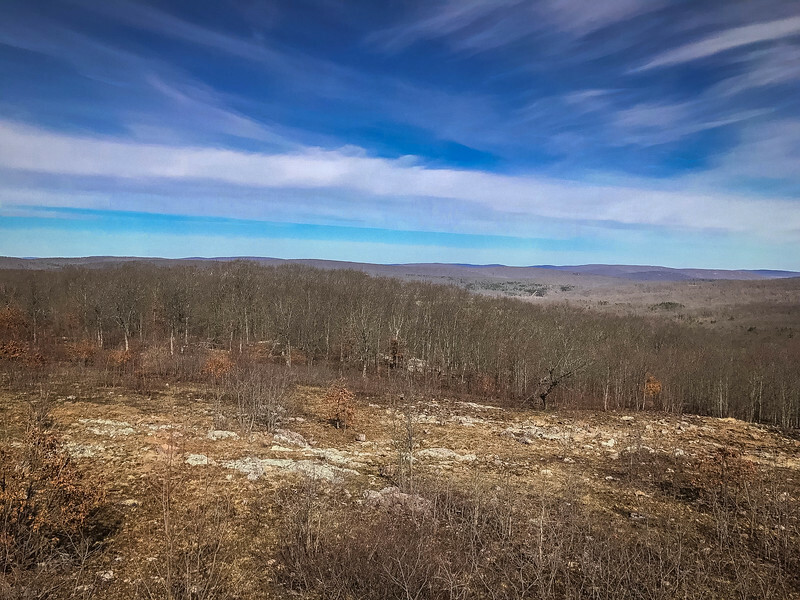 As you will later see with some of our other recommended spots worth visiting close to Taum Sauk Mountain, this unspoiled landscape is epitomized by rugged natural beauty. The various overlooks provide ample opportunities for visitors to appreciate this landscape and it’s no surprise that this is a popular spot among local hikers looking for an idyllic paradise of solitude. I am sure you have probably been waiting for the ultimate experience of reaching the highest point in Missouri. Unfortunately, it’s a little bit of a disappointment and nothing at all like we expected. After parking our vehicle, we followed the directions through a wooded area in search of the highest point. The information plaza suggested that the “highest point” could be found by following the picturesque trail for just over 1,000 feet. Surely there was a spectacular overlook awaiting us when we reached the end of this trail? Actually, when we arrived at the highest point in Missouri, we honestly had no idea about it. 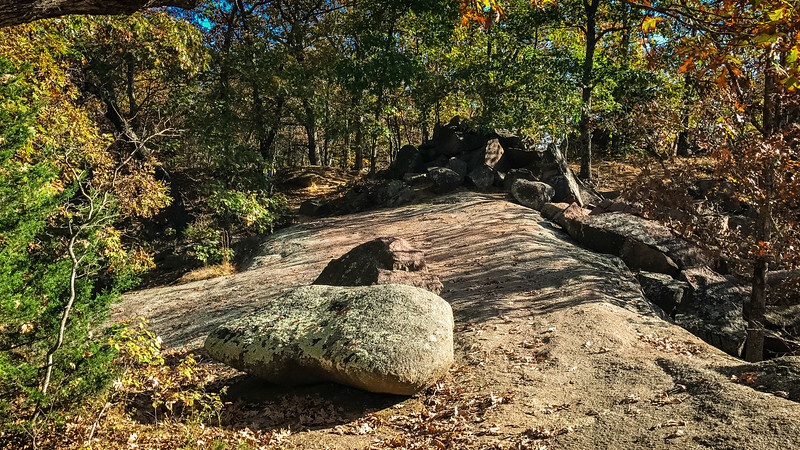 In the heart of this wooded forest, a large rock with a plaque signifies the tallest point. I recall looking at Heather and asking her if she thought this was serious or someone was playing a joke on visitors to the area. Nope, the plaque is pretty much it and when you arrive here, you can grab a stamp for your passport book of state parks and remind yourselves that you reached the summit by visiting a rock in the middle of a forest. 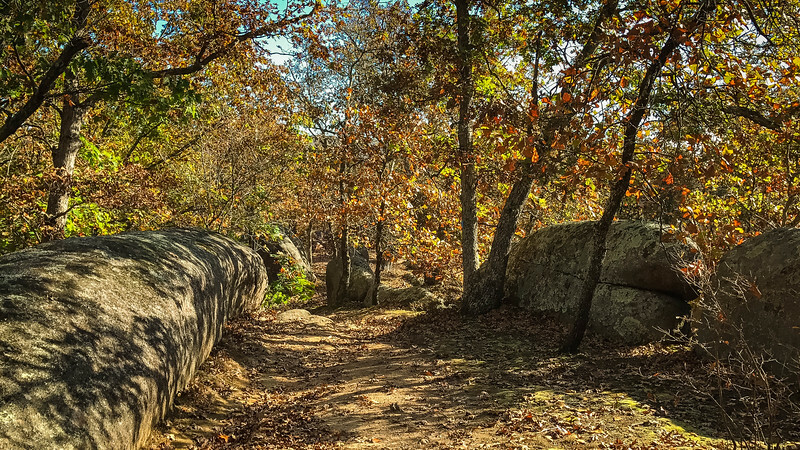 After stumbling across this “rock,” we soon realized that exploring this part of Missouri was much more than just finding the highest point. 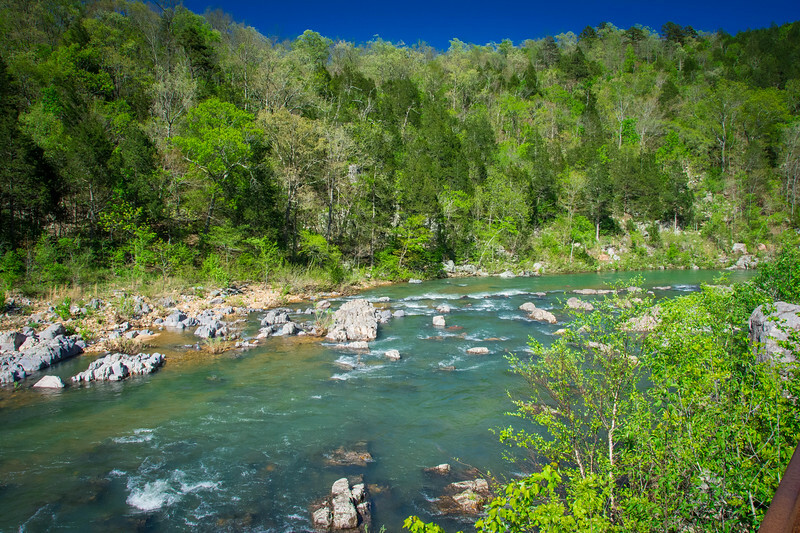 From this point, you can start hiking deep into the Ozarks to enjoy some spectacular scenery. 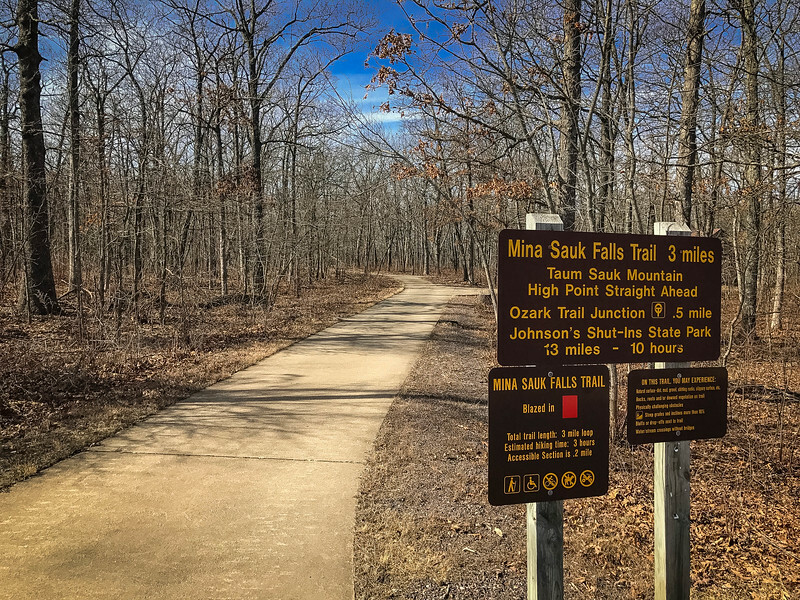 The Mina Sauk Falls Trail is a three mile, moderately rugged hike that offers visitors the opportunity to the tallest waterfall in the state. The 132-foot drop over a series of rocky ledges is definitely a hike worth experiencing for any avid waterfall aficionados out there. If you continue along this trail, you will reach Devil’s Tollgate, an 8-foot wide passage through volcanic rhyolite that stands 30-foot high! 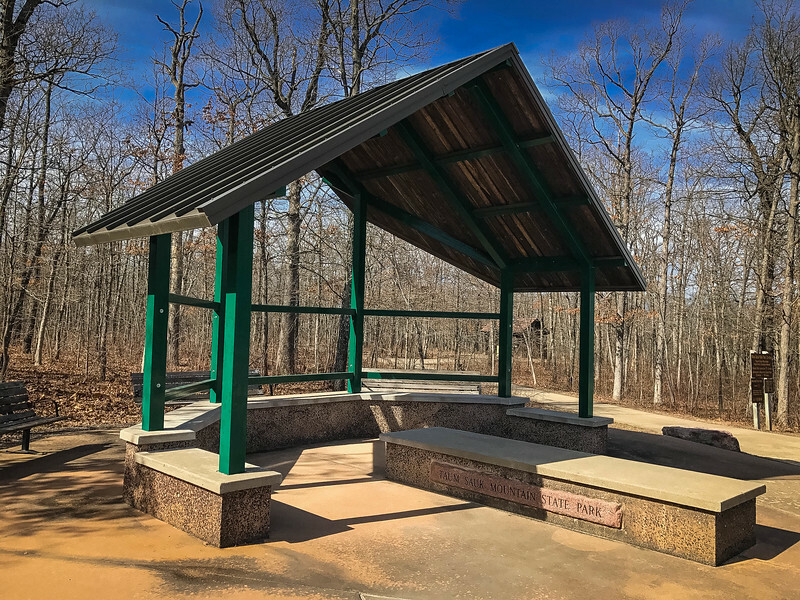 Taum Sauk Mountain State Park features a campground containing 12 basic campsites for those looking to stay overnight or explore more of the Ozarks. Drinking water and a vault toilet are available so although it’s certainly not luxury accommodation, it’s a typical camping option that allows visitors to the area an option to stay in the heart of the St. Francois Mountains. 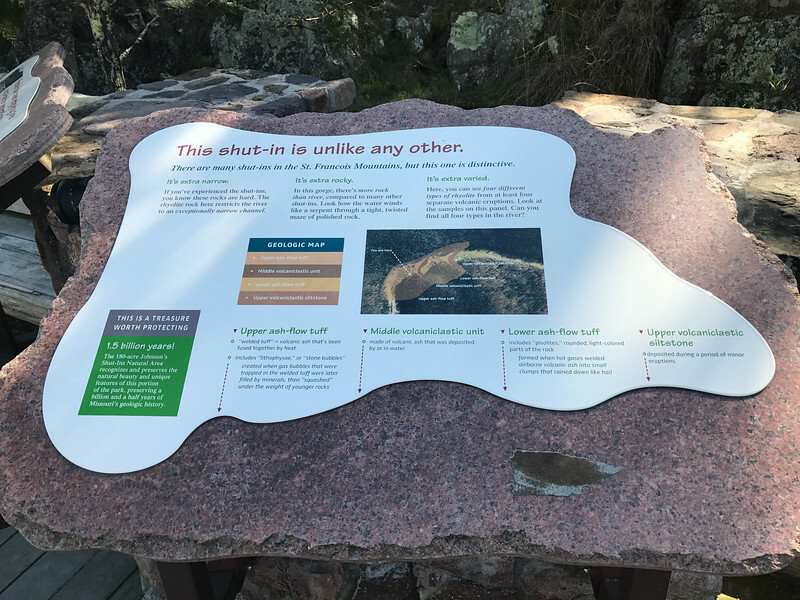 An on-site picnic area is also available along with a variety of information points which provide a valuable resource if you are visiting with little to no knowledge of Taum Sauk and the surrounding wilderness. 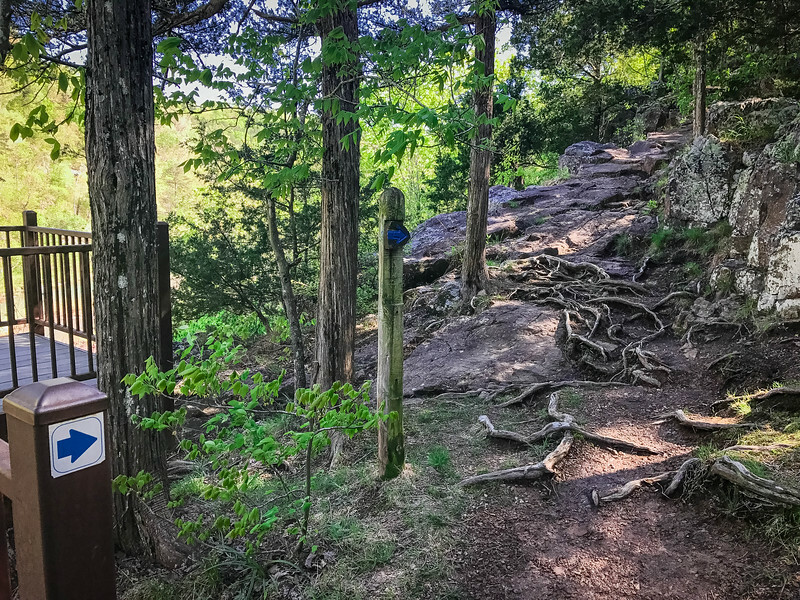 The Taum Sauk section of the Ozark Trail is a 35-mile stretch with numerous trails that take aspiring hikers over historic mountains that offer amazing vistas and overlooks and of course, for those that love waterfalls as much as we do, you have the opportunity to see the highest waterfall in Missouri along this section. 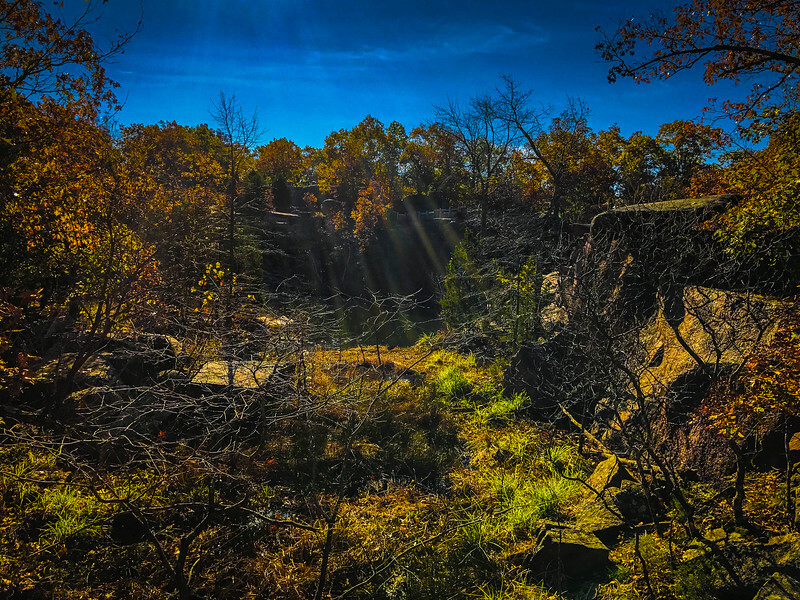 The rugged terrain of the St. Francois Mountains continues as you head over from Taum Sauk to another popular part of this region – Johnson’s Shut-Ins State Park. 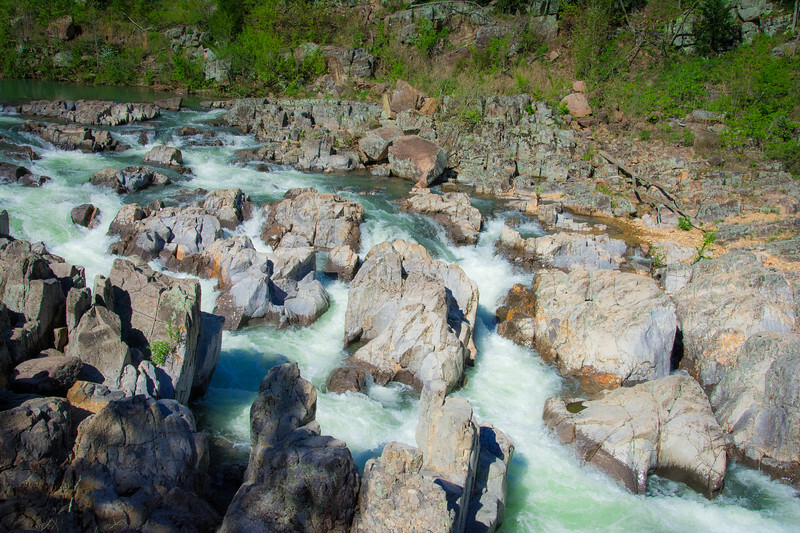 The history of Johnson’s Shut-Ins dates back over a billion years ago when the igneous rocks, bright pink granites, and blue-gray rhyolite rocks, were formed from a large amount of volcanic activity. 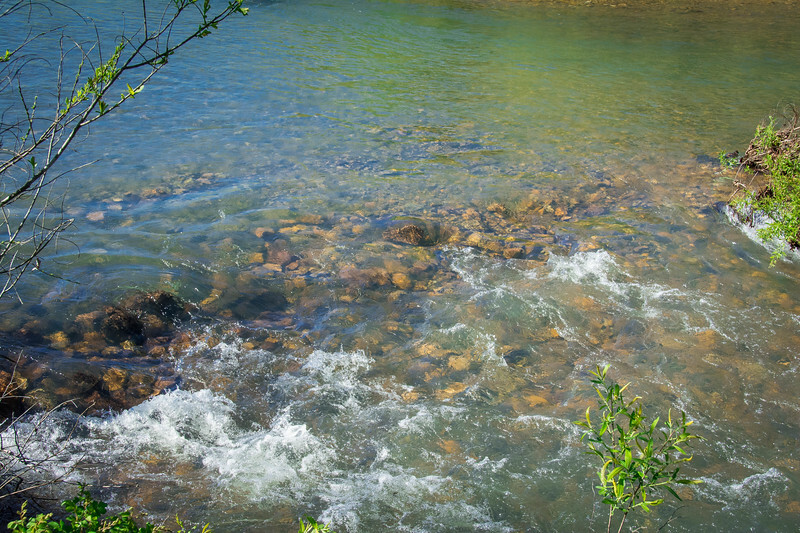 The Shut-Ins are undoubtedly the popular attraction here for visitors to enjoy a quick dip in the heat of summer. 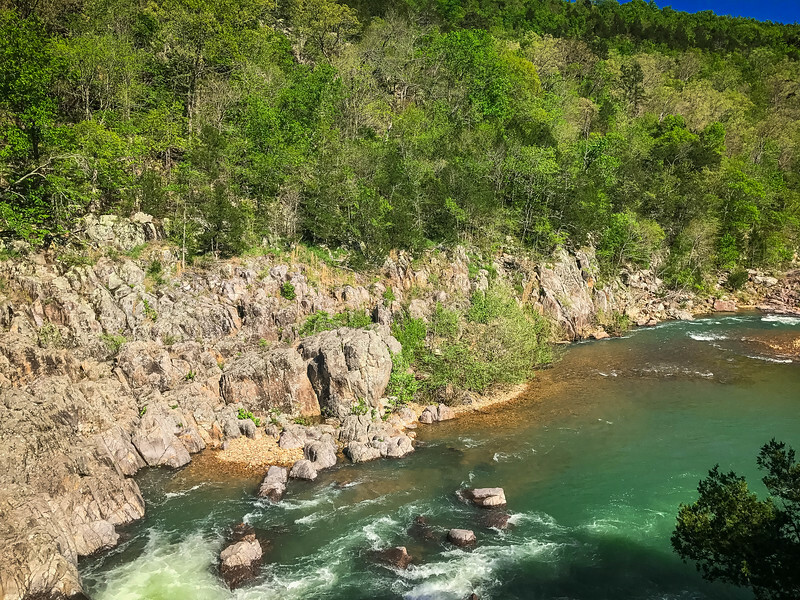 But there are plenty of other reasons to visit, including a number of scenic hiking trails and an observation deck overlooking the scenic pothole shut-ins and the valley beyond. For those that are just passing through and don’t want to spend all day hiking around, be sure to allocate at least one hour to experience the infamous Shut-Ins. 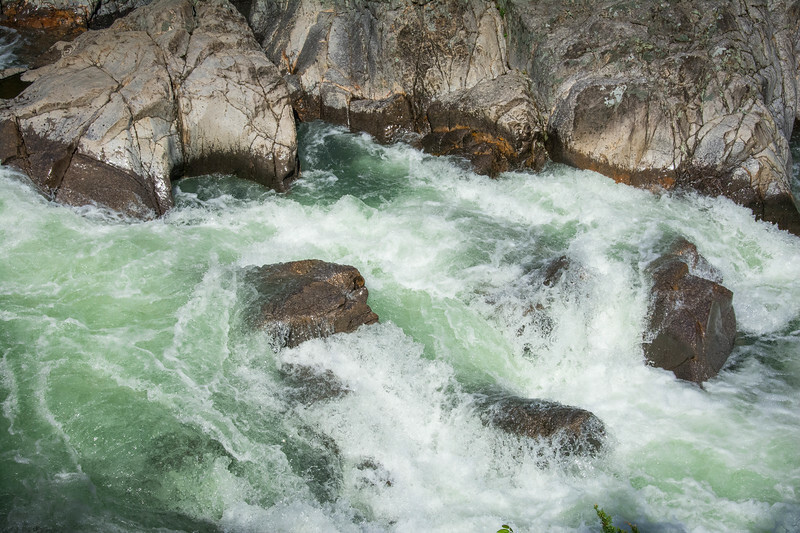 The short paved trail passes along the Black River and offers picturesque views throughout the valley and during our visit, the rapids that form as the river passes through the rhyolite rocks. 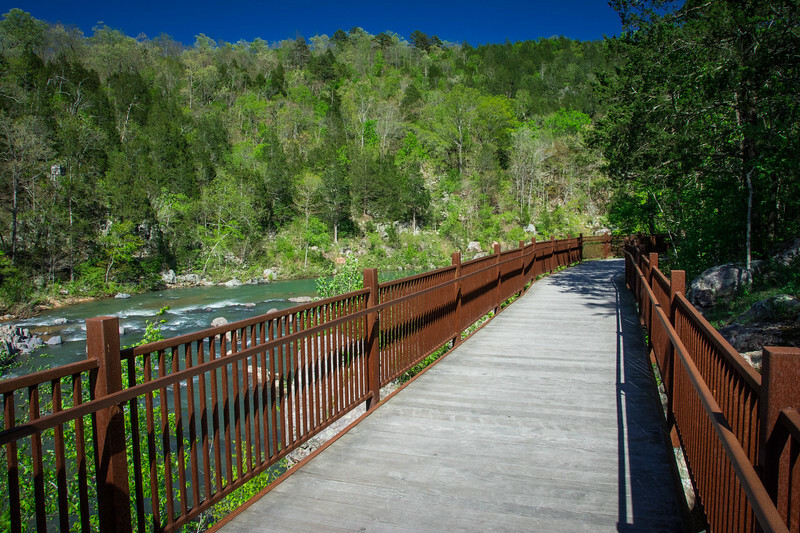 At the end of the boardwalk, there are a number of steps with more overlooks that are equally fascinating while the end of this trail offers the true adventure seekers the opportunity to wander into the Ozark wilderness by following the blue blazing on the trees. 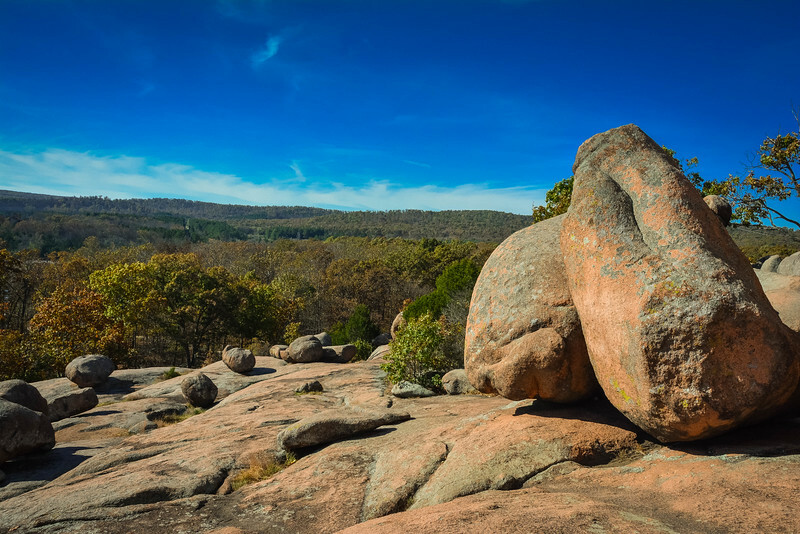 Perhaps the quirkiest attraction in this part of the Ozark Mountains is Elephant Rocks State Park. 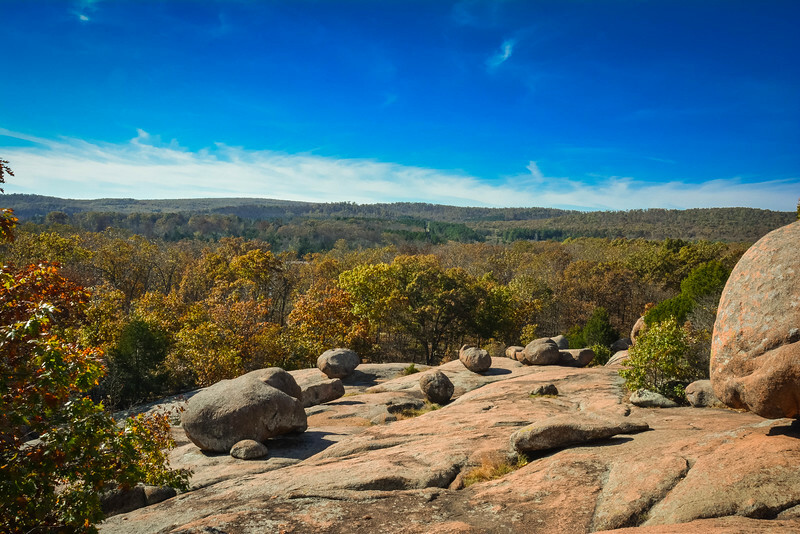 The giant boulders scattered across this landscape date over 1.5 billion years and today, provide visitors of all ages an opportunity to clamber over and enjoy spectacular views across the Ozarks. 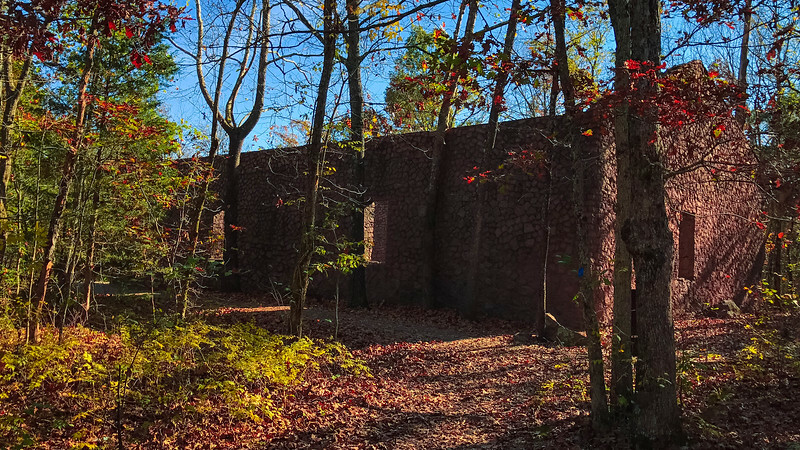 Hiking trails are yet again at the forefront of the best activities here, in particular, the short Engine House Ruins trail which runs through some rugged, natural terrain before arriving at an 1890s engine house that was used to repair trains that passed through this part of Missouri. 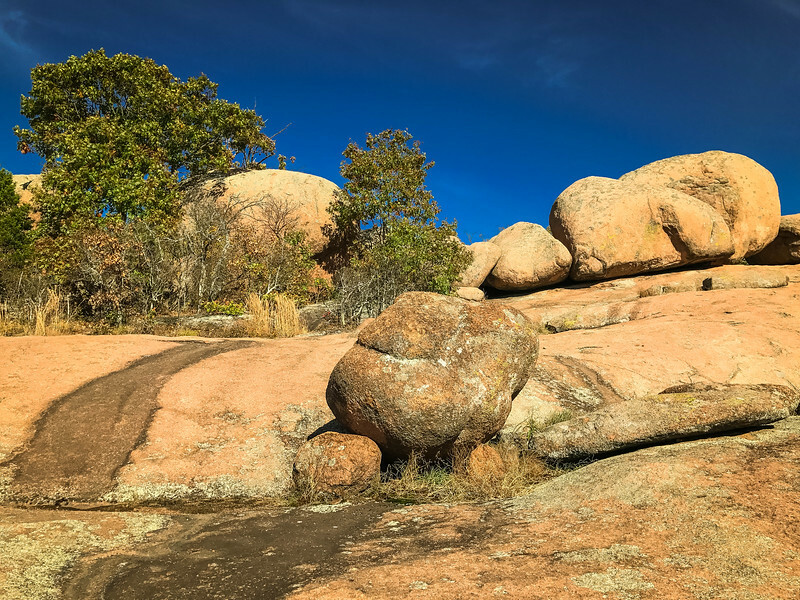 But the real attraction at Elephant Rocks State Park are the granite boulders that everyone wants to enjoy. 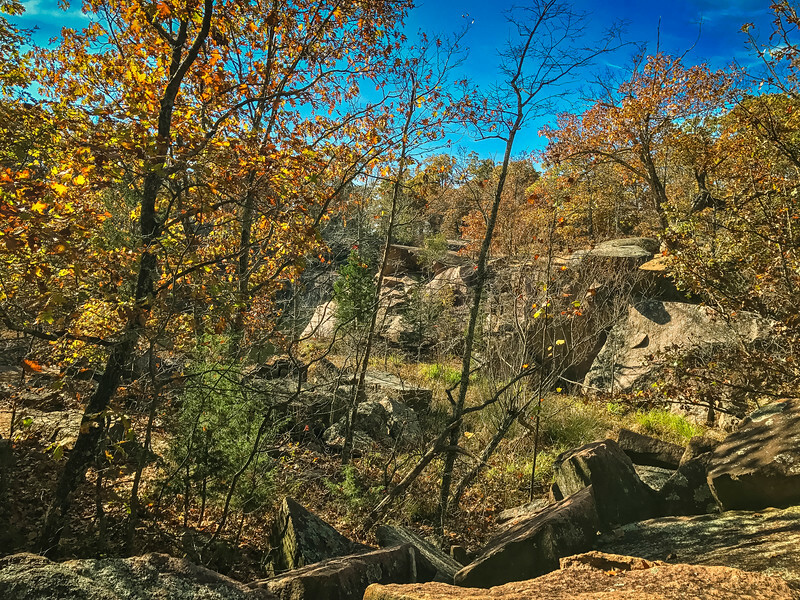 The hiking trails throughout the park lead you to some of the most spectacular overlooks among these boulders in the heart of the Arcadia Valley. 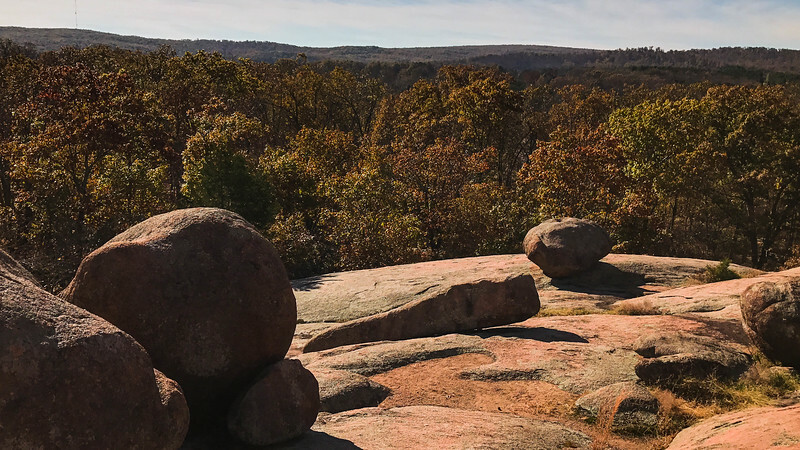 Although the journey to the top of Taum Sauk Mountain in the Arcadia Valley may end with a tinge of disappointment depending on what you were expecting, it’s well worth visiting this part of Missouri to appreciate the natural beauty throughout the rugged landscape. 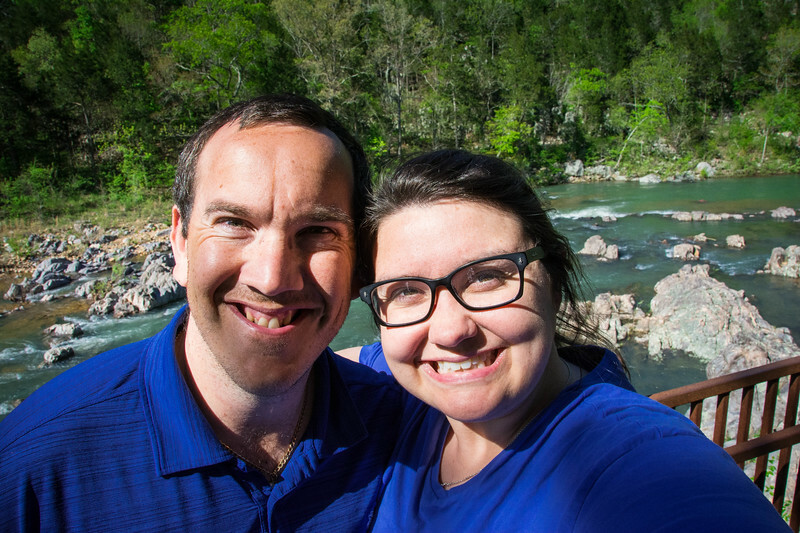 Johnson’s Shut-Ins State Park was probably our favorite spot throughout the valley as the views over the river and rapids was breathtaking. 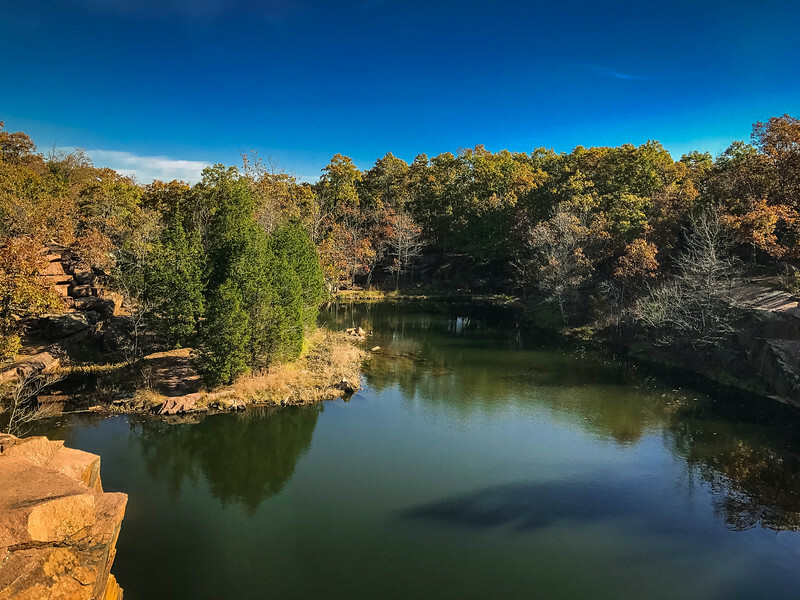 It’s possible that we visited at the perfect time of the year when the river was high but regardless, the scenery around the Ozarks is spectacular and truly a hidden gem in the heart of Missouri. I will let you determine the beauty or value in visiting the specific point noted as the “top of Missouri” but I think it’s fair to say your motives should be far beyond seeing this one spot and your experiences throughout the mountains will far outweigh your impression at that one solitary rock signifying the highest point. Do you have any desire to climb to the highest points in states? Do you enjoy hiking and do you have a preference over the landscape that you hike? 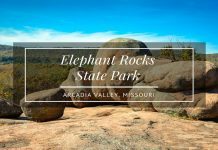 How to See Elephant Rocks State Park in the Heart of Missouri? 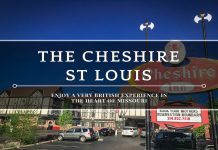 Cheshire St Louis – How to Enjoy the Perfect Boutique Experience? I loved your article and totally enjoyed the photos. Frankly, by looking at the pictures, I would never guess that Missouri looks like this. Granted, I crossed it once in a car at night, so who am I to judge. It’s just so unexpectedly beautiful. 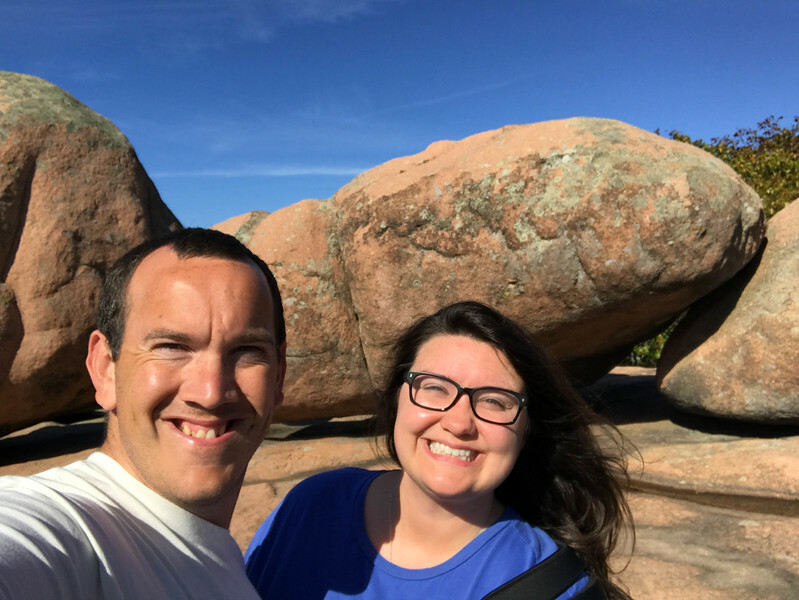 The granite boulders at the Elephant Rocks State Park are magnificent. The vistas are mind-blowing. Thank you for showing absolutely stunning and not necessarily a well-known place. Cheers!